You have added Petal Applique Chiffon Maxi Dress in Butter into shopping cart. Romantic, dreamy, and angelic describes this beautiful chiffon maxi dress. The Petal Applique Maxi Dress is fully lined and made entirely of chiffon. It has a square neckline and lined and lightly padded bust for support. Cutout flower appliques at the bust add a whimsical touch to this dress and give way to the empire waistband decorated with a twisted chiffon “rope”. The spaghetti straps on this dress are adjustable and fabric ruching at the back of this dress expands to fit your shape. This beautiful dress would be perfect for any upcoming formal event—it would also make a lovely bridesmaid dress. Details: Fully lined. Lined and lightly padded bust. Adjustable spaghetti straps. 60% silk, 40% polyester. Lining: 100% polyester. Hand wash cold water separately. Color will bleed. No bleach. Hang to dry. Small measurements: Length from top of bust to hemline: 50”. Bust: 32”. You have added Petal Applique Chiffon Maxi Dress in Butter into Wishlist. You have added Petal Applique Chiffon Maxi Dress in Butter for Stock Notification. 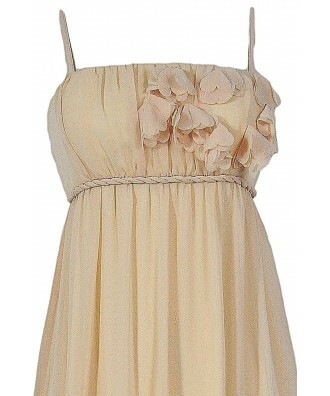 You have set Petal Applique Chiffon Maxi Dress in Butter as a loved product. 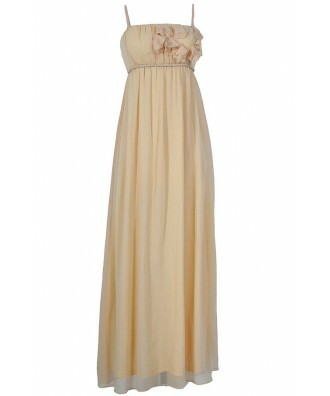 You have removed Petal Applique Chiffon Maxi Dress in Butter as a loved product.